It was… surreal; and is perhaps the only time watching children’s television where I wondered whether the producers had hired Monty Python to work as consultants. For some strange reason, our family was reminded of this scene in the last week. Sheep seem to have been on my mind lately…. You see, there is a conundrum which to some degree we all face, but I think may be amplified in the LDS Church. For we are not only sheep, but also shepherds. I say it’s amplified in the LDS Church, because we Mormons enjoy a lay ministry, where pretty much all of us serve in some capacity or other in our local congregation: that might be teaching a class once a month, or it might be heading up the youth organisation for boys or girls, or it might be Bishop – basically the pastor of our congregation. Or indeed it could be a whole host of other things. But because each of these “callings” may last anywhere from a few months to several years – at which point we will be asked to do something else – at some point or other it is not uncommon to be asked to serve in a position of leadership of some type. We are effectively asked to be the Shepherds of a group of people – perhaps children, perhaps youth, perhaps a proportion of the adults, and so on. On top of that, we have what I think is a rather uncommon way of caring for each other, in that each adult in our local congregation is asked, along with another, to visit the homes of a handful of people each month to see how they’re doing and whether they need any support. The idea is that we all are then caring for each other. So in that sense, we also serve as Shepherds to those individuals and families too. It’s a fabulous system. Of course, because it’s implemented by us mortals it’s not perfect, but certainly in theory it’s wonderful. Most importantly for me, of course, are the shepherding responsibilities my wife and I hold for our children. The difficulty – and here’s the conundrum – comes in that in becoming Shepherds it can become forgotten that we are also still Sheep. Don’t get me wrong – that’s a good message, and there are probably times for most of us where a kindly kick up the backside is necessary. This saving souls thing is important after all, and can easily get inadvertently sidelined by all sorts of things of lesser importance. But how do we know if someone who is not being a terribly good Shepherd is neglecting their responsibilities or whether they are, in fact, in need of their Shepherd. We are, after all, still all Sheep. A Sheep who is lying alone on the top of a windswept hill, bleeding and in desperate need of succour, doesn’t need to be told that they’re not working hard enough at helping others. Indeed, such an accusation may well do more harm than good. I’ve been in that place, where the failures of my life were all too apparent to me; where I was wondering what the point of continuing to try were. And then dragging every ounce of my strength to go to a meeting I had been asked to attend, was basically told there that I wasn’t doing well enough and needed to try harder – to do more. To be honest I was doing enough self-flagellation without my Shepherds joining in. So, what to do about it all? I don’t really have any answers, I’m afraid, just some observations. 1. When we are acting in our roles as Shepherds, let’s remember that we are looking after Sheep. Yes, some of them may be Shepherds too, but we need to care for them. We have no idea what many will be suffering in their own lives, so let’s tend them just as the Saviour cared for the Sheep in his parables. 2. These Shepherds of ours who can occasionally sound harsh when what we may need is more Shepherding… well, they’re just doing the best they can too. They love the Lord and I think often have frustrations that so little is done when there are so many people who need help. And let’s remember, they’re Sheep too. 3. 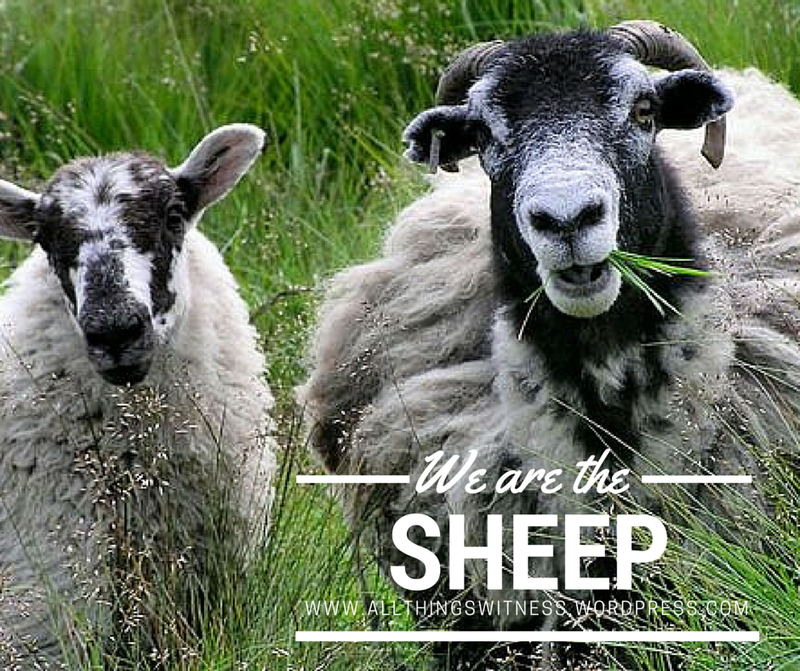 Sometimes we can get so caught up in our Shepherding duties that we can forget that we, too, are Sheep. When Christ taught the parable of the lost sheep, he followed it up with the lost coin and then the Prodigal Son. The three parables are all related: first he saves one out of a hundred; then it is one out of ten; finally it is one out of two. The focus of the parables increasingly narrows until it becomes very personal. Hopefully we don’t lose one of the key messages: we are all the lost sheep; all the lost coin; all the Prodigal Son. All of us, like Sheep, have gone astray. We all need saving. We all need the The Good Shepherd. Whether we are acting in role of Shepherd or not, let’s remember that lesson. It’s why we’re here – to be saved. Yes, we are all Sheep. If you liked this post, please feel free to share it with someone who you feel might benefit from it.